We hosted a spring time bee themed shower for one of our dearest friends, Melissa, a few weeks back to celebrate her “Baby Bee”. Alyssa of Ginger Rose turned our studio into a daffodil dream & Rebecca and Joy of Sugar Spun Fun made a honeycomb cake that we still haven’t stopped talking about. We wanted to create an extra special shower invitation for Mel. She had an inspiration board for us & we ran with a pale pink and goldenrod yellow palette. It felt feminine and energetic and perfect for a shower honoring her baby girl. The invitation is a two color letterpress piece and the bookplate, bee tag, and envelope liner are one color. We decided to mix it up with typography paring a more traditional serif with whimsical hand lettering for a relaxed vibe. The bee is a custom illustration that we then cut into a tag & tied on with thread. When Amanda from The Impressionist approached me about doing the flowers for Melissa's Baby Shower, I knew that I wanted to do something fun and seasonal, which is where my inspiration to use many different varieties of Daffodils came to mind! 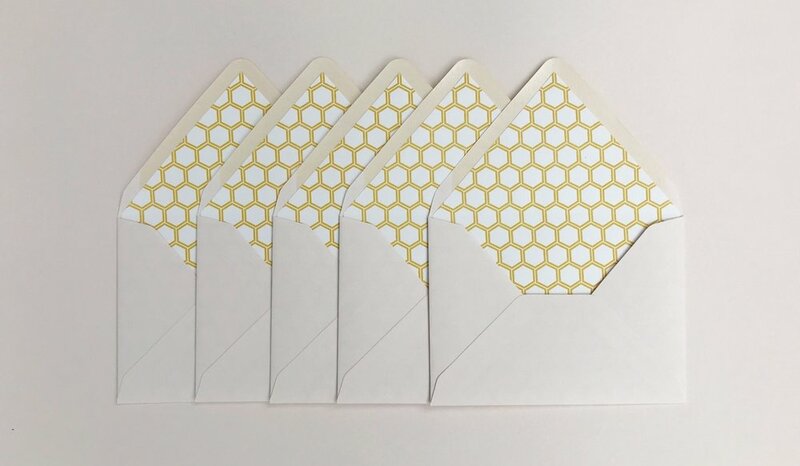 Daffodils are one of the first official flowers to bloom during the Springtime, so I wanted to use them to mark the time of year that the baby shower took place, as well as to tie in the "Honey Bee" theme because they are such a great shade of yellow! From there, I decided to do a textural, floral-heavy garland that would serve as a focal point for Melissa's special day! To do this, I incorporated different shades of Waxflower and Mimosa blooms to highlight the different varieties of Daffodils. The end product resulted in a fun and funky garland that was both fragrant and seasonal for Melissa's Honey Bee Baby Shower! We had a blast dreaming up this extra special shower for Melissa & Baby Bee. We hope this inspired you for your next baby shower!